Locomotive control, Sound control systems and Batteries. We fit Mtroniks and 4QD controllers to our locomotives. The RL424V is a relay board for use with Mtroniks sound modules to control engine start/stop, two tone horns and head lights. We also fit 4QD to our locomotives. Please phone for more information on our controllers. We now supply all or any of the following. 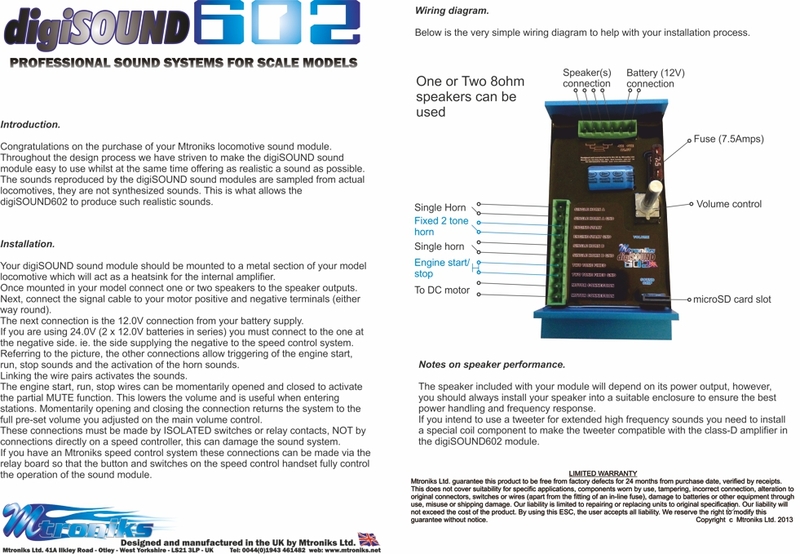 The digiSOUND602 - Is a professional 2 x 50W sound module from Mtroniks for larger scale models that comes with the engine sound installed, the engine sound is stored on a user changeable microSD card. This allows the user to swap and change engine sounds with any of the engine sounds available from the Mtroniks Ltd. sound library. When you collect your locomotive. For use in 5" gauge Locomotives. All our 5" gauge locomotives are 24v. For use in 7.25" gauge Locomotives. All our 7.25" gauge locomotives are 24v.